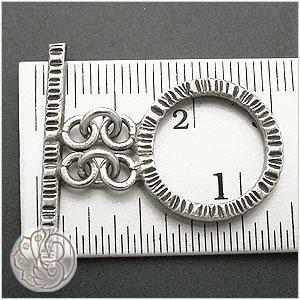 · Wire thimbles...I love you! Oooh! 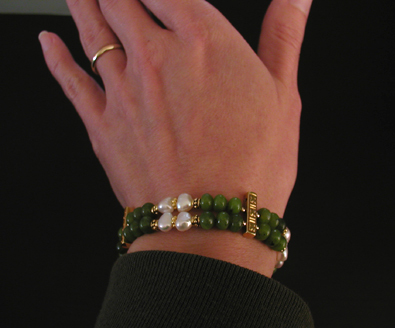 I'm excited...I just glued the ends of my four strands of knotted pearls. Tomorrow I'm going to get up early and try finishing the piece. Normally it wouldn't take this long. I found the most difficult parts were getting together the right thicknesses of silk, and figuring out how to knot with doubled thread. I started out with Griffin silk, with the "built-in needle," but ended up using Gudebrod Champion silk in size D, with separate needles. The built-in needle is handy for straightforward knotting, where you don't need to double the thread, but it's not the most practical if you're doing anything different. With the Champion silk, I made my own built-in needle...just cut the thread twice as long as you need (it's about a yard or meter for a non-choker-length strand, so cut two yards), thread the needle on, and make a double thread. Knot the two ends together and thread on your clamshell. I put a tiny silver bead between the clamshell and the first knot, hoping that will keep the silk from fraying. Then you string on a bunch of pearls and start knotting. It's not like the Griffin thread, where you have to string all of the pearls before you begin to knot, but it does go more quickly if you string a bunch, then knot them. I had to do a slightly larger knot than a regular overhand knot...here I just added an extra "turn" on the overhand knot, if that makes any sense. With #0 Griffin silk I had to do more than one extra turn...it was a pain. But with Champion size D, just one extra turn did it. I learned a few things...even if the knot feels right, you have to inspect it before making the next knot. If there's too much slack, you can still fix it by adding in another plain overhand knot and incorporating the slack knot into it...but if you've already knotted the next pearl, you can't do that. I tried stretching out the silk while I was working with it. In fact I'm wondering now if pre-stretching the entire thread is a thought, the way you'd pre-stretch stretchy cord. The knots don't actually have to be 100% perfect, I screwed one up and tried fixing it by threading in some extra silk and knotting that. It won't make it 100% perfect (were I doing a single strand, I'd restring the entire thing) but for this multi-strand piece, I was satisfied with it. Once you have the materials and method, and your tool of choice (tweezers or awl), it goes pretty quickly. Still working on my first project! 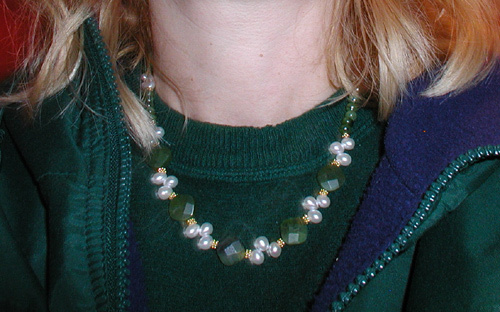 I had decided to make it a multi-strand pearl necklace, and haven't had much time to work on it. The first strand is finished--large freshwater pearls on #4 silk. I haven't glued it, but the clamshell is knotted in place on one end; waiting for the rest of the strands to be knotted before finishing the other end. 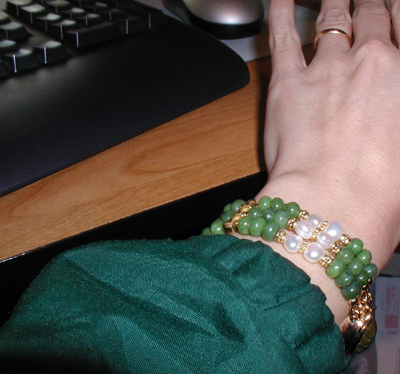 The second strand, of small pearls...eh...I tried doing it on #0 silk, doubled. #4 was too thick and I didn't have anything else on hand. Bleh. I got the strand done, using a larger knot. #0 is so thin, the usual overhand knot is too small. But I don't want to use this technique any more; it's too time-consuming, and uses too much silk (doubled, 2 meters of #0 is just enough to do one standard-length strand of small pearls). While I was doing this strand, I found you can rescue a knot which comes out a bit too far from the pearl, by adding in another overhand knot, and incorporating the first knot into it. I don't know if this will work with thicker silk (the resulting knot might be too big), but for fine silk, it worked well. So I need to buy more silk. I'll probably go with artbeads.com. I've ordered from them many times; they're quite reasonable, free shipping, no minimum purchase, and most items can be bought by the piece. Despite all the head-aches of figuring out the right kind of silk and how you wish to finish the ends (clamshells vs. french wire), it's a good skill to learn. Say you wanted a necklace of large round beads. You could string them on softflex, but knotting makes the strand look so much nicer. 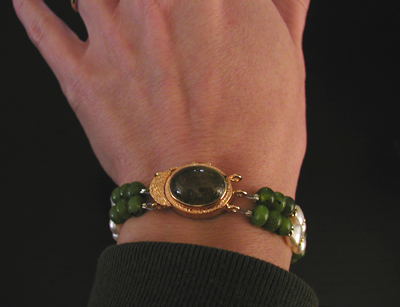 That's one aspect of making anything jewelry, that is not obvious to people who don't do it. Unless you own the bead store, you're perennially short of at least one item you need to finish the piece, at least until you've been short enough times to own tons of materials. I even tried altering my design to use larger pearls, but they all have these miniscule drill-holes. It's just as well, since I need to restring another piece; hopefully I can cover both in a single bead-shop visit. The other piece is more complicated and I'm not sure how I'm going to do it. It's four strands of very small pearls, with the four strands coming together at the top of each end of the piece, joining into a single strand, which is then attached to the clasp. The thread (it looks like cotton) at the tops is exposed and beginning to fray. I'm thinking if I redid this on silk, and used french wire to cover the exposed parts of the silk, it should work, but still it'll probably take a couple tries before I get it the way I want it. I finally got around to trying this. Why did I wait so long????? It's actually not too difficult, though it is time-consuming (then, everything to do with making jewelry tends to be time-consuming). I got the silk and clamshells yesterday, along with a strand of pearls, at Bead Castle in Berkeley. The owner was very helpful and recommended Griffin #4 silk for those particular pearls. I did my first knotted strand yesterday. Since I don't own a bead awl, I used a very skinny mandrel from a jump ring set. This worked okay (the mandrel is too skinny to make jump rings with, btw) but you really need either the awl or knotting tweezers, or something very similar. I got the tweezers today. The awl seemed scary sharp, and the tweezers looked handier (if your knot looks as if it isn't going to be placed correctly, you can still get it apart again with the tweezers). I wasn't 100% happy with my first strand, but I'll have to say it looked pretty decent. Like anything else in jewelry making, you want it to be perfect, so you have to practice some. So I'm planning to redo my initial strand--started it tonight in fact--and make a four-strand necklace. 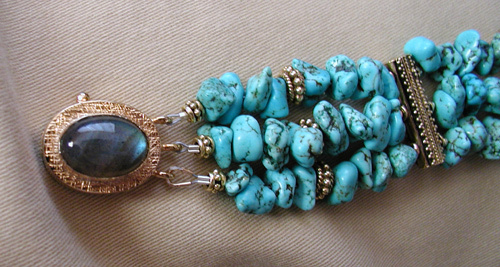 I want to do something like this (from Blue Oyster Pearls Necklaces Catalog) but simpler, something I can wear to work. I have the one large pearl strand, but I'm planning to use it with three strings of small pearls, rather than use five kinds of pearls. Having just begun, I can't advise much, but I didn't glue the knot into the clamshell on my first try. I was too chicken. A good thing, since I need to redo the strand! I can say it's well worth the effort of knotting; stringing beads straight is not the same. The knotted string drapes better and imo looks better too. 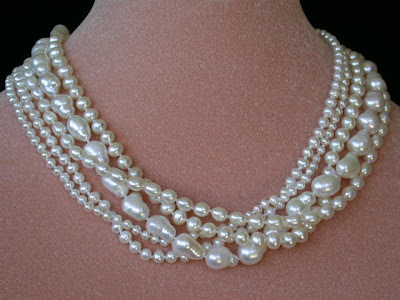 Plus the more obvious advantages--the nacre of pearls strung without knots (or spacers) is supposed to wear away eventually--and knotting adds some instant length to the strand, meaning you can stretch out your pearls and cut the weight of the necklace. This is what I was noodling around with yesterday. The fun part is in getting the strands to lie correctly. I'll have to try out wearing it today, but at least in theory, the weights should be in the right places. Going to make some earrings to go with it too. Haven't been able to make anything new (or even redo anything old) lately...been fixing up the site. Got fed up doing it for a long time...now I'd like to get it back into shape. It's not going to be nearly as horrible as it looks now...I'm going to put a search engine on it (once at least some of this stuff gets crawled) so you'll be able to search it properly. ^ This is all labradorite and vermeil. ^ This is citrine and sterling silver. It's not a new piece, just a new pic. Top view of my Bali cage bead necklace. Same black Swarovski crystal and Bali vermeil necklace and earrings. The rest of the new pics are in my Picasa album. Pretty pleased with this...it's a bit longer than a choker, so it's comfortable on even with the multiple strands. I'm pretty pleased with this piece even though these aren't the best pictures. I've found with my (older) digicam, the lighting has to be just right or else the pics get out of focus to a degree. This is a bit more luxe than I usually make it, but it's a gift (note the gift bag! ), and I wanted to do something with aquamarines. 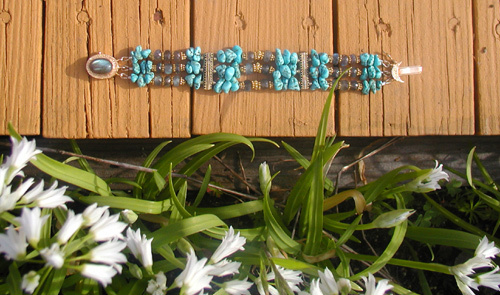 The strands are mainly faceted aquamarine rondelles, with some faceted labradorite rondelles and Bali silver beads. 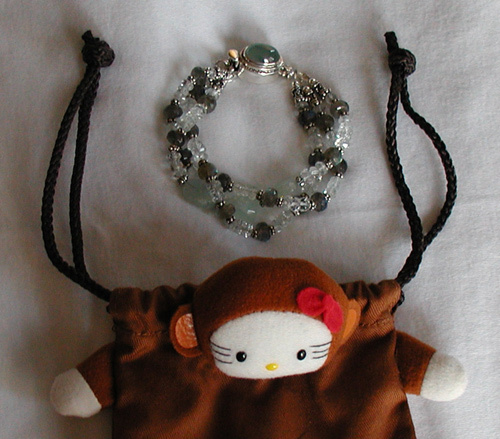 The clasp is also aquamarine and silver. 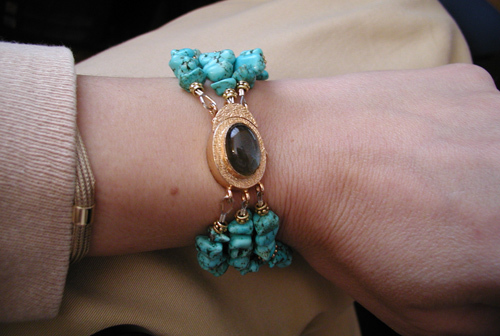 Got to try out that EZ Bracelet Sizer while making this piece. It does help actually. 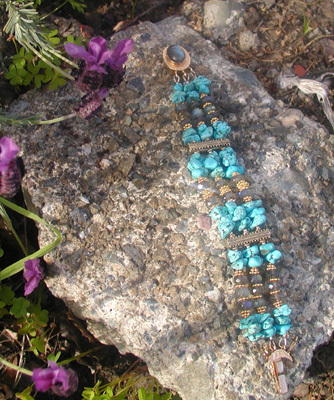 I started out with two strands, then decided to add the third strand with three aquamarine nugget beads in the center. It was too big with two strands but just right with the three. No crimp covers yet, still trying out the design. Getting a little bored photographing everything indoors...and inspired by the Heartworks by Lori site, where she uses natural objects such as flowers, shells and leaves in her photos...thought I'd try out a few outdoor pics. Hm. Mine are probably not as good as my indoor pics in commercial terms, but I'm loving the idea of including natural objects somehow...especially for stone jewelry, or pieces with a tiny bit of roughness to them. Here I think the charm is in the tourmalines...because they're "rough" looking in real life, rather than transparent gem grade tourmaline. The colors range a lot too, I really liked the black-plum colored ones so I included some of them here. The pearls...as mentioned earlier, are those one-sided top-drilled ones. Doing them in a multi-strand design seems to keep a lot of the domed sides showing, for whatever reason. I have some pink keishi pearls I'm going to use for a "matching" necklace...it's...harder than it looks. Ideally the pieces should work independently, i.e. you should be able to wear any one piece alone and have it work. You should also be able to wear them as a set, and that's not something I have actually achieved as of yet. Even the citrine and silver "set" is not something I would care to wear all at once. I have it in mind to get more Bali silver beads (I got a lot of vermeil last time because I don't usually use silver) and make a pair of simpler citrine and silver earrings. Wondering if I should make it three rather than two strands. I'm going to get a silver three-strand connector bead anyway (just as I'm getting a vermeil one) so I'll decide then. This is the same necklace pictured earlier, only now you can see the back (and the fact that I haven't put crimp covers on it yet). There's still a possibility I may redo this piece...I'm going to get a three-strand vermeil connector bead anyway, so I may add that in the front. Or might not. I like it the way it is actually. Okay, I got rid of the double side strands and added more weight to the center of the necklace. The top pic shows the shortest length (choker), the bottom pic is the longest setting. If the side beads won't stay put, I'm going to ditch this design and get a three-strand connector bead to put in the middle. I'm hopeful about it though. Heh heh, I'm really nervous. This is my first "commission piece"; it's the first piece I've been commissioned to make for someone else. Did I put enough slack in it? It's a straightforward enough design, three strands of freshwater pearls (literally: three 16" strands transferred to softflex and double crimped, with wire thimbles). I tend to prefer slightly more, rather than slightly less, slack in my own pieces. Here I felt nervous so I didn't do that. Now I'm hella nervous. Did I mention I was nervous? This is it so far...as you can see, I still need to move the strands off the diamond-shaped part of the toggle and onto a jump ring. Ta da! Finally done with this piece. 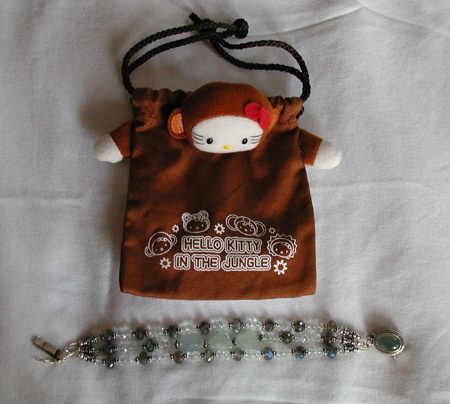 The key are the Bali vermeil beads, perhaps because they have so many kinds. Not the best quality pics, I took them just now. In the first pic if you look closely, the pearls have this eerie halo of light (at first I thought it was lint!). 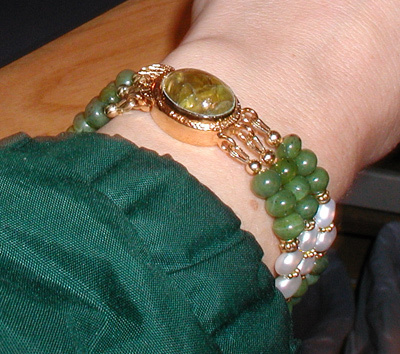 And the bracelet clasp is much prettier in real life. Oh well, just to give you an idea of the finished pieces. My wire thimbles came from Rings 'n' Things today...oh, these are worth it. They do make your loop bigger though...it looks fine but you do have to incorporate the slight extra length into your design. You'll note how much the wire thimble extends the length of the strand. When I get the crimps and actually make this piece, I'll likely take out the vermeil beads at the two ends of the strand, and just go with the look of a gf crimp cover terminating the strand. Here you can see again how much difference the wire thimbles make in terms of length and space. As you can see, I didn't bother stringing the third strand. I did the first strand to check the length...the second strand to see if the bead size would work with the spacer bars. When it's finished, it will have the infamous "wire guardians," plus of course some goldfilled crimp covers. 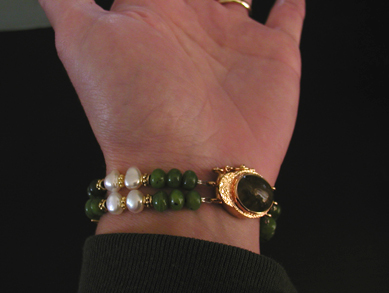 I'll also likely migrate the deepest-colored jade beads to the ends of the bracelet, since the stone in the clasp is a deep green color.